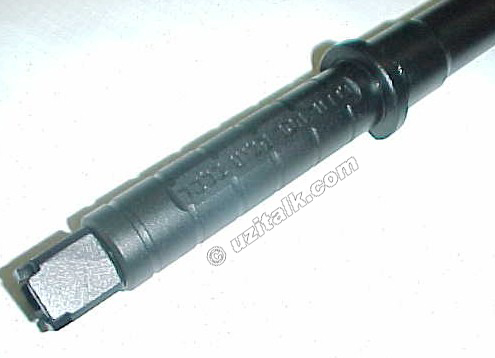 One of the appealing parts of the UZI design is the easily changeable barrel. This design lowered manufacturing costs and permitted soldiers to swap worn or damaged barrels in the field. The changeable barrel is also an advantage in non-military usage - primarily in the flexibility it gives an owner to select different barrels with a moment's notice. Original 9mm barrels are 4 groove right hand twist - 1 in 10". Original .45 ACP barrels are 6 groove left hand twist - 1 in 16". Comments: The standard barrel found on IMI, Vector and Group Industries original SMG configuration guns. Comments: Primarily done to share a suppressor with HK weapons. This barrel was converted to three lug by Gemtech. Chamber restriction groove: Yes/No - depending on who converted the barrel. Comments: Typically a standard SMG barrel that has been converted for a different caliber. This barrel was converted to .357 Sig by uzitalk member Top Cat. Comments: These are original semi barrels, not conversions from SMG barrels. IMI made short semi barrels for law enforcement and possibly for other markets such as Canada that doesn't have the same length restrictions as the US. It is illegal to possess one of these and a semi Uzi Carbine that it fits in unless the Uzi has been registered as an SBR. Comments: The standard barrel shipped in US semi-auto Uzi carbines. Comments: The standard barrel shipped on Mini SMG's. Two compensator cuts in the end of the barrel. The muzzle is back bored about 5/8", making it poorly suited for conversion to three lug. Comments: Even though it does not have compensator cuts, the muzzle is still back bored about 5/8", making it poorly suited for conversion to three lug. Comments: The standard barrel shipped in US semi-auto Mini Uzi's. Comments: The standard barrel shipped in US semi-auto Uzi pistols. Comments: The standard barrel shipped in US semi-auto Uzi pistols or in IMI conversion kits. All external dimensions are identical to the 9mm barrels. IMI produced barrels in other calibers. 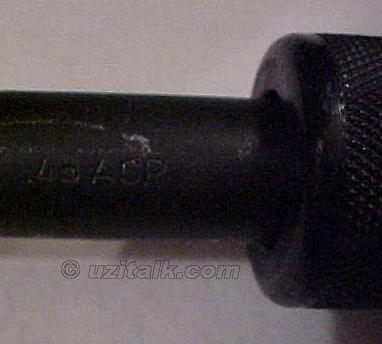 The barrel for a Semi carbine in .41 AE looks just like a 9mm semi barrel, except that it's stamped ".41 A.E." and with the date of manufacture. It also has three grooves around the muzzle end of the barrel for quick identification that it's .41 AE. The original barrels on .45ACP IMI SMGs were marked with their caliber. IMI also made barrels in 9x21mm. These barrels were only sold to Italy in an agreement between IMI and the Italian government. Italian law does not allow even the police to possess a gun chambered in a caliber that was used by any military in the world. 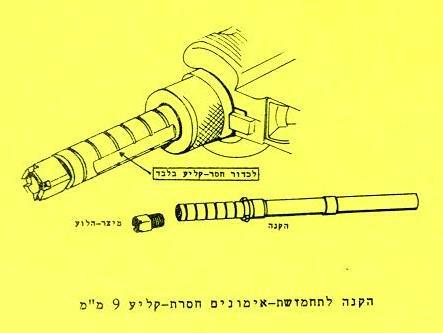 Another unusual barrel option for the UZI is this Israeli made barrel for firing blanks. The threaded plug in the end of the barrel produces the correct amount of back pressure to operate the weapon. The rings on the outside of the barrel are for distinguishing it in the dark. This is not a grenade launching barrel, as has been claimed by some.